Ltc. Jesus B. “Jesse” Rodriguez was honored in his hometown of Cotulla, Texas for his Combat service in WWII and The Korean Conflict this Veteran’s Day. He passed away on November 5th, 2018 at Spohn Hospital at 93 years of age. Jesse served in Guam, Guadalcanal, Okinawa. Discharged in Dec. 1946. Jesse attended UT Austin for a Geology degree then worked for Humble Oil until the outbreak of the war in Korea. 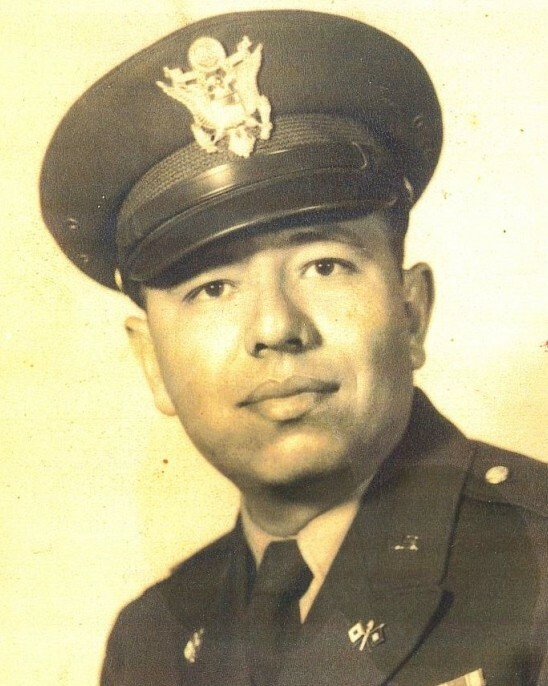 He was called back into service as a 2nd Lt. Oct. 1950 as an Executive officer for signal Corp. He was selected to be an Army Advisor to the Korean Army (KMAG) where he spent 21 months in the front serving a number of engineering assignments. After Korea, he transferred to the Army Reserve until his retirement in 1978. He lived in Corpus Christi, Texas and was a supervisor at Corn Products Inc. and was the physical facility director for Del Mar College. He was a Nueces Country Water Board Commissioner. During his service he received the following decorations: Republic of Korea (ROK) Wharrang Medal Authorized by the Army with one Silver Star, Army Meritorious Medal, Bronze Star Medal, American Theatre Medal, Asiatic Pacific Medal with 2 stars, Victory Medal WW2, Navy Commendation Medal, National Defense Medal, U N Service Medal, Korean Service Medal, Reserve Component Reserve Medal, Armed Forces Reserve Medal, Army Presidential Unit Citation, Republic of Korea (ROK) Presidential Citation. Ltc. Jesus B. Rodriguez is survived by his three children and their children. Clarissa Rodriguez and her husband Daniel Bires and their Children Austin Bires and Justin Bires. Susanne and Leon Rodriguez of Austin, Texas and their Children; Ryan Jesus Rodriguez and Lauren Cecilia Rodriguez and Jesus Caesar Rodriguez of Corpus Christi. A visitation will be held from 5:00 p.m. to 9:00 p.m. on Friday, November 16, 2018 at Seaside Funeral Home Chapel, with a Rosary to be recited at 7:00 p.m. that same evening. A Funeral Service will be held at 1:00 p.m. on Saturday, November 17, 2018 at Seaside Funeral Home Chapel. Interment will follow at Seaside Memorial Park.